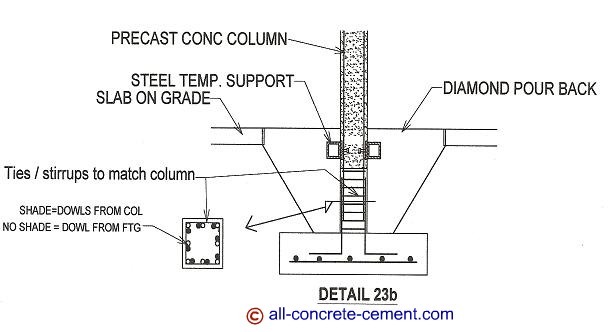 How is precast concrete column connected to the footing? Hi Bill- great question. Given that I'm not sure what type of column you have, I'm providing two options as shown in the details below. The first option is just like bolting a steel column or wood column to the footings. 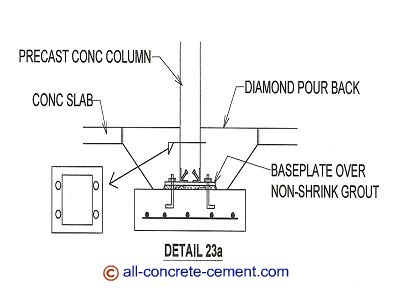 The precast manufacturer needs to install steel plates or angles at the bottom of the precast column. The baseplate can be welded to the bottom of the embed, install the leveling nuts on the anchor bolts, lower the column in place and bolt, you're done - pretty straight forward. The second option is shown on detail 23b. This is a little complicated. If the intend is to extend the precast with cast in place concrete, the column will have to have dowls sticking out from the bottom. The precast manufacturer must install steel embeds for erection aide. The column must be held in place for a period of time while the concrete is poured and cured. That's the reason for the embed plates shown where tube steel can be welded to it for temporary support. In this case you pour the footing with the dowls arranged to match those of the column. Lower the column in place, install the ties, install the form and pour. Notice that all the work are intended to be below the finished slab for obvious reason. All these has to be coordinated with the precast manufacturer. You don't want to pour your footing higher or lower than what your precast supplier had in mind. Good communication is key.